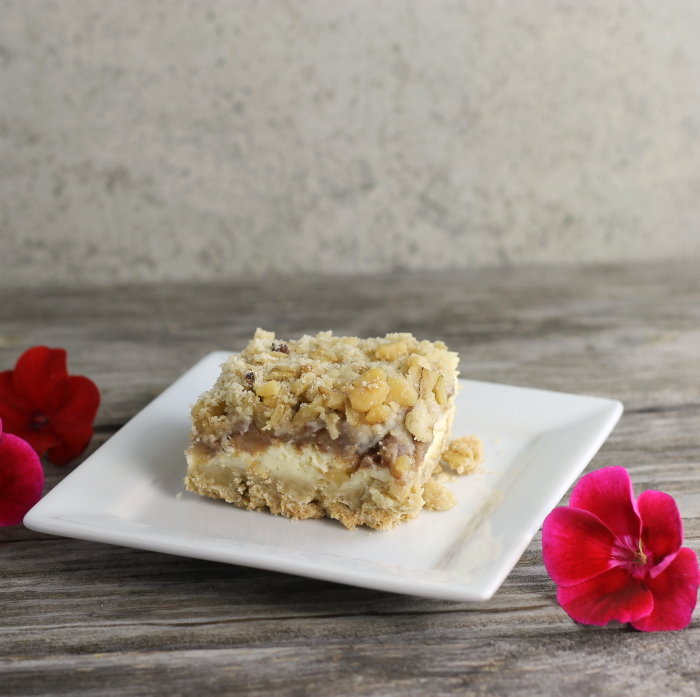 Pear cream cheese crumble bars, a moist bar that features a cream cheese and pear filling. Once summer comes to an end I start missing the summer fruits that I enjoyed baking with all summer long. But then along comes the apples and pears in the fall and I start forgetting about the summer fruits. I have always loved baking with apples; I have eaten my share of apple pie over the years. The last few years, I have discovered a new fruit (well not really a new fruit) the pear. In the fall everyone is talking about the apple and the pear is somewhat forgotten. Have you tried using pears in desserts? If you read my last post you see that I took dinner to my mom’s house this past weekend. I wanted to make a dessert to take along with the skillet chicken with mushroom gravy. I know that my mom loves pears. When I told her about the pear cream cheese crumble bars, she mentioned that years ago that she made pear pies, which I had forgotten. My grandma had a couple of pear trees in her back yard and she would give us some each fall. 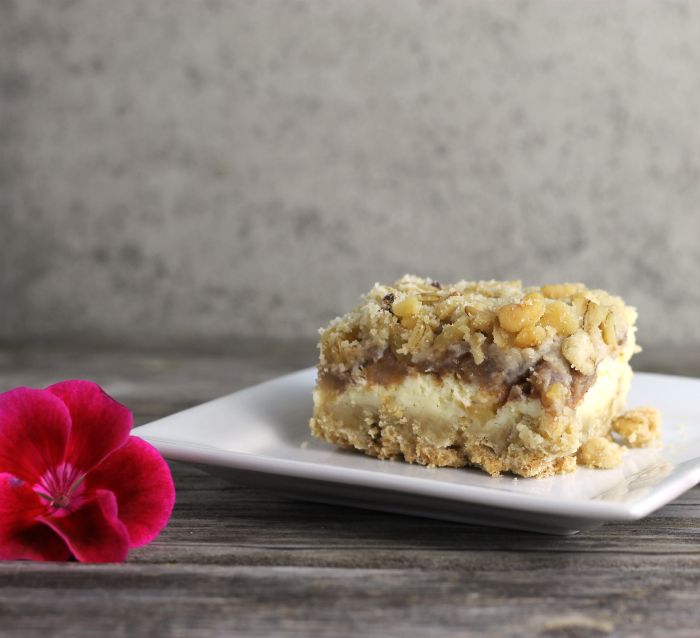 If you know me at all you know that I love a good crumble, it doesn’t matter if it comes with coffee cakes, pies, bars, or whatever. That is one thing that I adore about these bars. They are crumbly, moist, sweet, but not overly sweet, oh what the heck they are just plain delicious. Oh, I almost forgot, I do like Bartlett pears, but my favorite pears to eat and bake with are the Bosc pears. I find that I like the flavor of the Bosc pear better than the Bartlett. 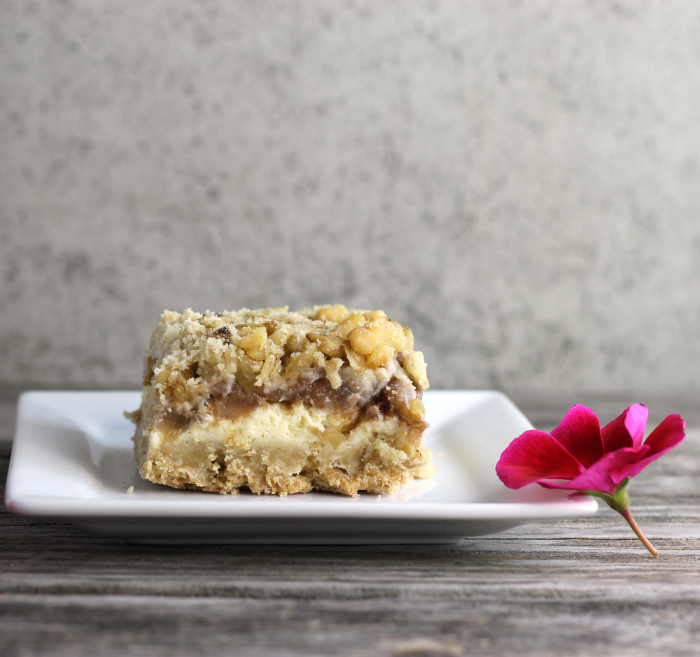 I used Bosc pears in these pear cream cheese crumble bars. Do you like pears? 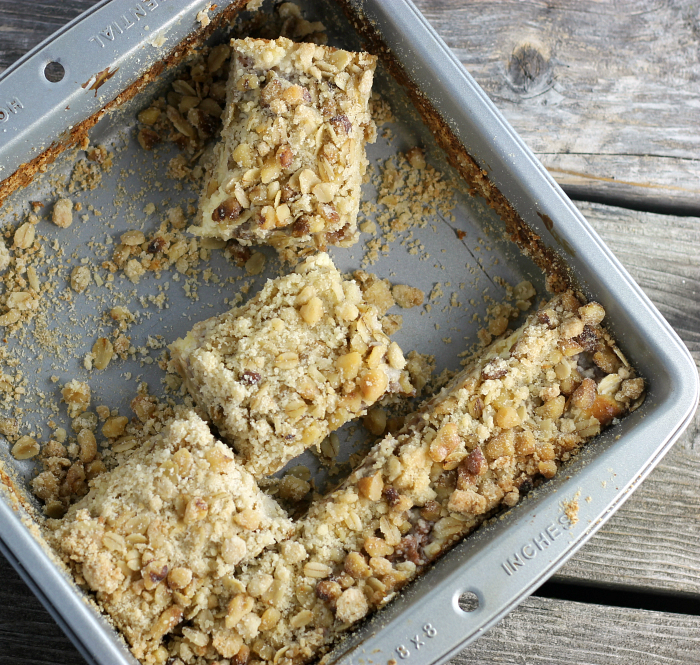 You have to make these bars, I am sure you will love them as much as I do. In a medium bowl combine the flour, oats, 1/4 cup sugar, 1/4 cup brown sugar, soda, and salt. Add the butter and with a fork mix until the mixture is crumbly. Add the rest of the crust ingredients into the prepared pan and press into the bottom of the pan. Place in the preheated oven and bake for 10 minutes. While the crust is baking prepare the cream cheese filling Add the cream cheese and beat , add the sugar, and beat in. Add the egg and vanilla and beat in. While the crust is baking prepare the pear. Combine the chopped pears with the 1 tablespoon flour, 2 tablespoon sugar, and cinnamon. Remove the pan from the oven with the crust after it is done baking 10 minutes. Spread the cream cheese mixture over the crust. Top with the pear mixture. Combine the reserved crust with the chopped walnuts and crumble over the top of the pear mixture. Place the bars back into the oven and bake for another 30 minutes. Remove from the oven and cool on a cooling rack. Cut into bars and serve. Source: adapted from one of my cookbooks (I adapted the crust recipe from this cookbook). Wow, to grow-up living around pear trees….what a wonderful childhood. Love crumbles. Yes! I use pears in bakes as well. Even a roasted pear sauce that is killer in muffins. I made the pear cream cheeses crumble this evening with some of the annual Harry and David pears we receive from my mother in-law. It was scrumptious. Not too sweet, great flavor and texture. I didn’t have walnuts so I used toasted pecans instead. Fantastic recipe. Looked just like the picture in the blog. Trish, I am so glad that you enjoyed the recipe. I hope that you will stop by again. Excellent recipe! My family loved it.